This is my son at the pumpkin patch costume contest where he took first place this year in has garden snail costume… or as he calls it a “scary snail that eats cows”. 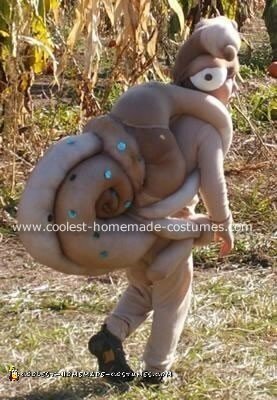 I made the snail costume in about 4 hours. It consists of 4 pair of pantyhose, some quilt batting and a pair of googley eyes. I dyed a pair of long johns beige to match and that was that. I hot glued everything together first and then reinforced the stressed areas with some stitches. He is able to slip in and out of it rather easily as it’s a backpack. I added embellishments with a cheap, bedazzler knockoff and a drop of hot glue. The costume is a little heavy, but manageable for him (unless he tips over). All in all, this costume cost a little over $20. The pictures don’t do it justice. hi do you have any more pics that you wold mind sending me?…..my son has an ugly bug ball to go to and this costume is perfect!! I love this costume. Can you tell me how you made the headpiece? My grandson wants me to make him one just like it. Could you please explain how you wrapped everything altogether? Do you have any other pictures? This is a great costume and I need to make one for my son’s school play. Please post info on how you make the costume.How do you wrap it all together so that it sits on the child’s back and doesn’t slide around or tip over? And does the headpiece connect to the rest of the costume? thank you! I love this costume! Would you mind sharing with me how you made it, and more pictures?